Our communities are making great strides towards equality and access to healthcare, but we still recognize the disparities and health issues that we face disproportionately. Obesity, substance use and abuse, cancer, tobacco use, HIV/AIDS, and mental illness still plague us. Suicide among LGBT youth remains a heartbreaking and unfortunately frequent occurrence. 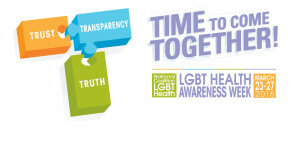 The theme of LGBT Health Awareness Week this year is “Time to Come Together: Trust, Transparency, Truth.” This weeklong series of events is organized by the National Coalition for LGBT Health and is designed to draw attention to the disparities that we face. “It’s time to build more TRUST that our providers and the healthcare system are sensitive to and addressing our personal identities and health needs. It’s time for TRANSPARENCY in our healthcare systems to be more open and honest about services and costs to help ensure greater access to healthcare. We must advocate for authentic and complete data collection of sexual orientation and gender identity to reflect reality. The Coalition brings together national and state LGBT organizations, health centers, health departments, universities, health organizations, clinical and behavioral health providers, and LGBT individuals and allies to raise awareness of LGBT health equity issues. Transparent Data Collection: Leo Kattari, Health Policy Manager, One-Colorado — addressing the need for state and federal policies to ensure increased transparency in data collection focused on sexual orientation and gender identity. Transparent Public Health Systems: Kevin Cranston, Director, Bureau of Infectious Disease, Massachusetts Department of Health — demonstrating Massachusetts’ experience with health reform, increased transparency and greater data collection and the impact on LGBT health. Transparent Health Insurance: Brian Hujdich, Executive Director, National Coalition for LGBT Health/HealthHIV — discussing specialty tiers for chronic disease treatments and the need for more transparency in coverage and pricing in some insurance plans. Transparent Government Programs: Rhett Buttle, Director, Private Sector Engagement, and Nick Martin, Special Assistant, Office of the Secretary, U.S. Department of Health and Human Services – highlighting the current successes in increased transparency under ACA and where there are needs for further protections that the advocacy community can help to move forward. Transparent Health Services Research: Christopher Cannon, Senior Manager, National Coalition for LGBT Health — announcing the launch of the nationwide survey to assess LGBT health across the country from multiple perspectives: consumer, provider, and health care systems. To support the campaign and bring awareness to LGBT health issues, please join in by using the hashtags #TIMETOGETHER, #TIME4TRUST, #TIME4TRANSPARENCY, #TIME4LGBTTRUTH, and #LGBTHealthWeek throughout the week and beyond.